We are thinking of adding an option to export contacts to Google contacts and tasks to Google Calendar. Would you like us to add such an option? Please comment. Absolutely! We were doing it manually but with limitations. Can we do it in tuition too? Currently we added this only in the fundraising application. But you get the same accounts there as in tuition. Why would you need this in the tuition app? to be able to see his tuition balance also..
can the last five payments and charges also be synched? You can now request support to add to the note any info you want exported to Google Contact note. We have now added the Google Contact syncing option. This is still in beta testing mode. It should work correctly. We are still planning on adding feature to it based on customer response and requests. To use create a query and view records by the mail merge tab in reports. After you see all the account you want to merge click on the sync tab in the bottom. Click on the Update Google button. 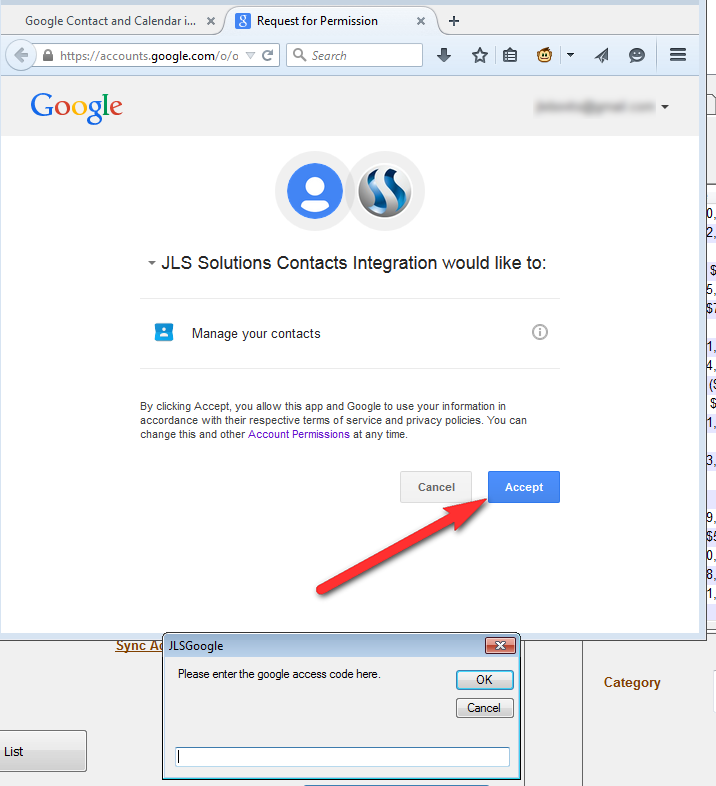 The first time its used you will need to grant permission for JLS Solutions to get the contacts from Google. A web page will open up requesting you to sign in and give permission. Once permission is given you will be shown a Google Secret code. 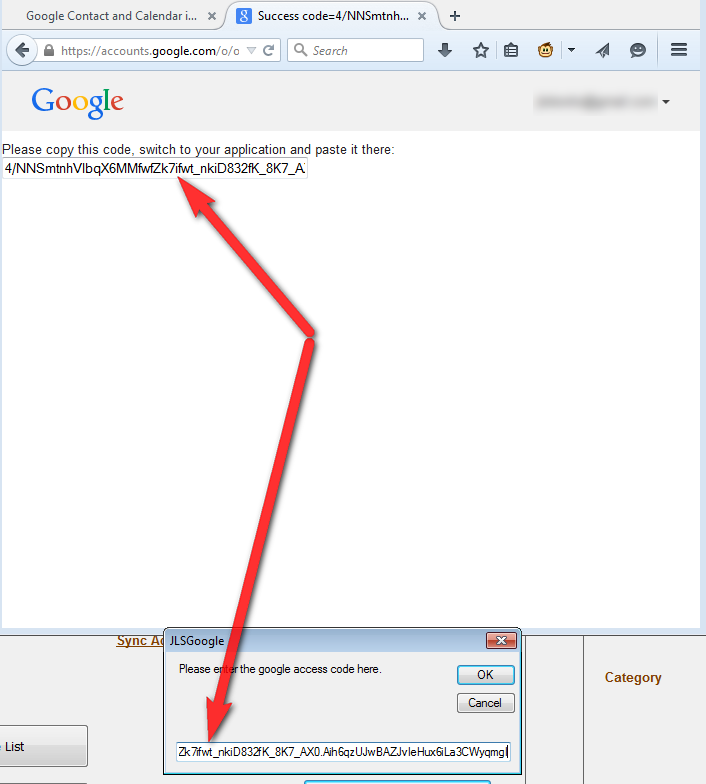 Copy this code and paste it in to the box that opened up "Please Enter the Google Access Code here". The Google account gets linked with your user name in our software. Next time you sync it will automatically sync with this account. If you want to switch accounts later you should check in Change Google Account before the next sync. Added the option to enter a group name where the contacts will go in by google. You can choose any existing group from the dropdown or type a new name and it will create such a group. It works very good !!! Can you please add the calendar too ? I Only have an option to merge to outlook, is there any way to change that or do I have to contact our computer tech? You must have a version after may 14. Meanwhile we have only 5 people that want this feature. If there is anyone else please vote or comment that you want this added. Is there an option for Outlook? now they added google as well . can u please a the option that I can select to upload only cell phones ? can u please add the option that I can select only staff not the spouses of my staff ?